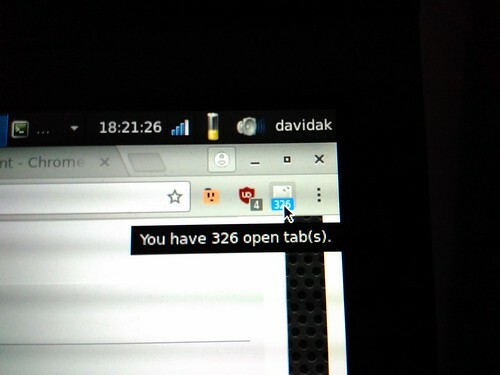 Browser Tab Hell: There’s a Chrome Extension For It. I rebooted the system I use for writing most this morning after I did a firmware update. Then, I opened my browser. This happened roughly 4 hours ago and I went about things normally. Suddenly, I have 24 tabs open. I can’t tell you how it happened. The part of me that doesn’t want to take responsibility for my actions was quick to come up with a theory that browser tabs actually procreate and have children tabs. This makes sense since at least some of the tabs are clearly descendants of others, despite the fact that they are graphically shown as a line across the top of my browser. In a way, they are descendants… and I’m apparently the medium through which they procreate. It’s hard not to feel a little dirty and used when you think about things that way. In the end, I am responsible for this mess. I did this to myself. How can I possibly avoid it? One school of thought is that one should avoid opening tabs. I don’t subscribe to that point of view. What I would subscribe to, however, is improving browsers so that they don’t keep tabs open beyond an amount of time that I want them to stay open, degrading like leaves on a wet day. Well look at that. Despite coming up with the idea on my own, someone beat me to it – if you’re running Chrome, check out this Tab Autoclose Timer so you won’t have to ponder the existentialism of browser tabs.